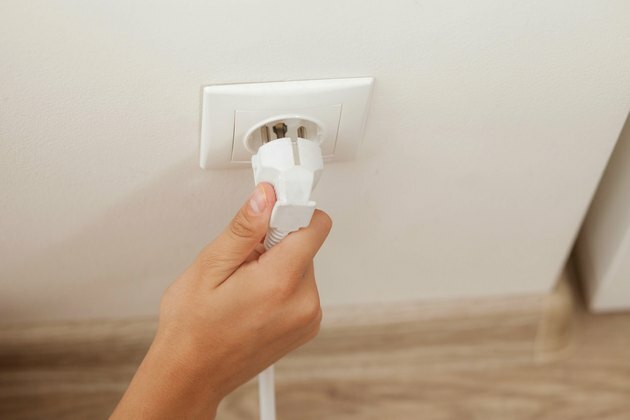 Wiring an outlet for 230 volts is identical to wiring an outlet for 220 or 240 volts. When electricity is wired into a home, the power company delivers electricity at 120 and 240 volts with a plus or minus of 5 percent. Therefore 220, 230 and 240 volts are all interchangeable and wired the same. This is an extremely high voltage to work with, so when wiring an outlet for a stove plug or that of any other large appliance, consult a licensed electrician if you have any questions before beginning this project. One of the big differences between 115V vs 230V wiring is that 230V circuits have two hot conductors instead of one, so the cable should enclose four wires: two hots, which are red and black, a white neutral and a ground, which is bare or green. If the circuit is dedicated to an appliance that does not need auxiliary 115-volt power, the neutral can be eliminated. In that case, the cable would include only the two hot wires and the ground. 230 volt wiring requires 10-gauge or larger wire which, because of its size, is hard to bend. To ensure secure connections, it's a good idea to crimp ring or fork lugs onto the ends of the wires and use these to connect the wires to the terminal screws. Turn off any power to the wiring at the main circuit breaker box. The circuit breakers are typically labeled by number inside the breaker box door. The breaker will be a double pole switch, which is larger than the typical 110-volt breaker. Strip off one end of insulation off the end of each of the insulated wires (black, red, white), where the outlet is to be wired and mounted. Run the wiring through the back of the hole in the outlet frame and out the front. Slide the outlet up the wire and over the hole where the wiring exits the wall. Attach the outlet frame to the wall, using the screwdriver and screws included in the kit. Connect the wiring to the outlet prongs and tighten each screw down on its wire to secure it in place. Connect the red and black (hot) wires to the two brass screws labeled hot. Connect the white (neutral) wire to the silver screw labeled neutral. Connect the bare (ground) wire to the green screw labeled ground. Place the outlet cover over the outlet frame and insert a screw into each hole and tighten them down to secure it to the outlet. Turn the power back on at the circuit breaker box and test the outlet with a plug-in tester before plugging in the appliance. Never perform any work or repairs on an electrical cable without first turning off all the power sources. Failure to do so could lead to electrocution and possibly death. Even after turning off the breaker, you should always test wires with a voltage tester before touching them. Always use insulated tools and, as an extra safety measure, wear rubber-soled shoes and rubber gloves.